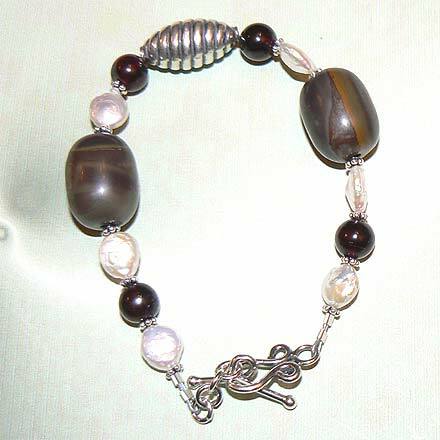 Sterling Silver Chrysanthemum Jasper, Garnet and Freshwater Pearl Bracelet. al jeweler add links to extend the toggle clasp, however this is not a service that we provide. Unusual patterns of Autumn tones accented with deep red Garnets and white Freshwater Pearls. The bracelet is 8.1". For those who are interested in Astrological significances of stones, Jasper corresponds with Virgo and Leo, Garnet corresponds with Capricorn, Aquarius and the month of January, and Pearl is associated with Gemini and Cancer and the month of June.